Nova Scotia has 4 distinct seasons. Most tourists visit in the summer months of June, July and August. The sun is usually shining, temperatures are between 20-30°C and the days are long. It’s a great time to explore a beach or go to a festival. September and early October are also good times to visit. Cooler autumn temperatures bring out beautiful fall foliage. Entire valleys turn into rainbows of orange, red and golden yellow leaves. Days tend to be clear and crisp with bright blue skies. Winter sets in during November and December. Nights and mornings will be below or near freezing temperatures. Many seasonal tourist attractions will be closed until springtime. By January, Nova Scotia is paradise for skiiers and snowmobilers. 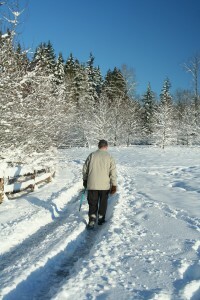 The Wentworth Valley is where you can rent a cottage to enjoy our winter wonderland. Spring arrives slowly. Temperatures start warming up in March and the first spring flowers appear towards the end of the month. But there can still be a snowstorm or cold rain. Snow flurries can appear into the early part of May. By early June, it’s t-shirt time again.